On the other hand, it is pretty satisfying to have a grandfather clock with long term atomic clock accuracy. This note describes a tuning mechanism that automatically adjusts the grandfather clock to its highest possible accuracy with an error of about 2 seconds per week and essentially no long term error if you keep it running and have a good time base. Generally, a grandfather clock, like most pendulum clocks, uses a substantially free-swinging pendulum with a pendulum arm supporting a weighted bob that swings about a pivot . 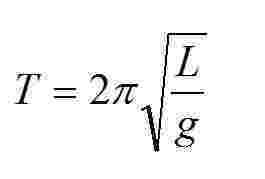 The separation between a center of mass of the pendulum (roughly the center of the bob) and the pivot (the pendulum length) may be controlled by an adjustment nut on a threaded rod extending from the end of the pendulum arm. The nut supports the pendulum bob which may otherwise slide along the pendulum arm. 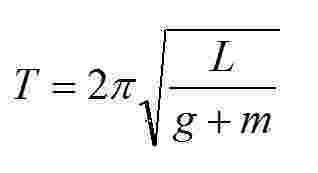 where T is the time for the pendulum to complete a single cycle, L is the length of the pendulum between the center of mass of the bob and the pivot and g is the acceleration of gravity. Interestingly, I suppose to most people, the weight of the bob doesn't figure into the equation as Galileo worked it out many years ago. So that pretty much leaves you with L for tuning unless you want to change g which at first glance seems about as hard as changing the value of pi. where m is an integral of the instantaneous magnetic force vector between the rare earth magnet and the steel plate over the arcuate swing range (which because of its symmetry will generally be a vertically oriented vector aligned with the gravitational vector g) and represents roughly average force imparted by the attraction of the magnet and the steel plate over the swing range . Adjusting the plate upward or downward will increase or decrease the value of m, respectively and so the steel plate is mounted for such vertical movement. In a first version (below) a stepper motor turns a cam that raises and lowers the plate. The advantage to this design is it can't go berserk and move the plate into the pendulum. A second design, which is less berserk proof, attaches the plate to a helical drive shaft on a stepper motor. 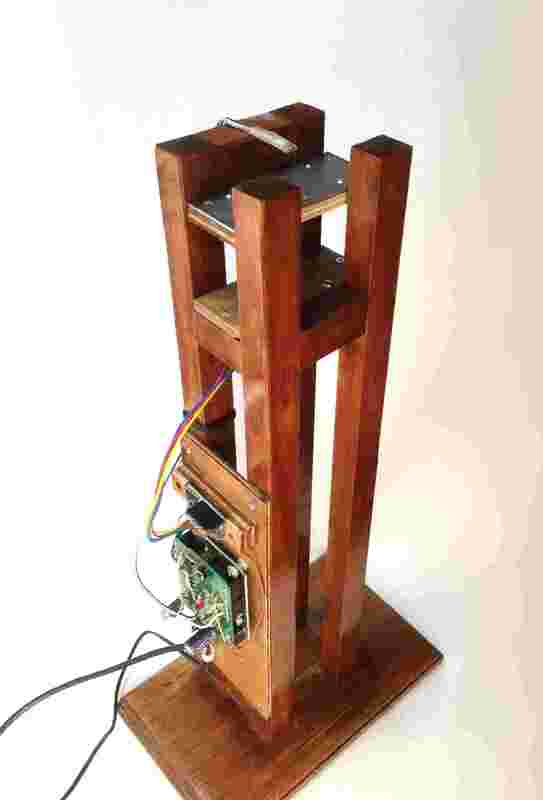 In either case stepper motor is controlled by an Arduino which may further receive a signal from a Hall effect sensor positioned between the magnet and the steel plate and activated by the magnet during some part of the swing of the bob to reveal the actual period of the pendulum. The Arduino monitors power line frequency using the wall voltage but it would be easy to use a real-time clock instead. When the number of pendulum swings detected by the Hall effect sensor is less than would be required for a perfectly tuned pendulum for a predetermined interval of time, the steel plate is moved up toward the pendulum bob and when the number of pendulum swings is more than would be required for a perfectly tuned pendulum for the predetermined interval of time the steel plate is moved down. The particular control loop implements a proportional/integral feedback loop which means it reacts both to the instantaneous error and the cumulative error so that you don't get into a case where the clock is running at the right speed but five minutes late. I keep it running because I'm trying to see if I can detect the gravitational influence of the moon :). But it can be easily turned off once the desired accuracy is obtained. When turned off, or the case of power outage, friction holds the system in its last state providing the highest degree of static tuning possible. Before this is installed, the pendulum needs to checked to ensure it is running a bit slow, which it will be with the added magnet and a bit fast when the plate is in the full up position. I've gotten a lot of interesting comments from the Hack-a-day website. Several commenters note that previous auto tuning pendulum clock designs have been developed including one in the Amateur Scientists column run by C. L. Stong ( September, 1974). These designs attempted to change the frequency of the pendulum by a pulsed magnetic field carefully positioned and timed to the pendulum swings and require constant energy usage. In contrast, the present design doesn't require synchronization, careful alignment with the pendulum and very little power is required once the initial tuning is accomplished. 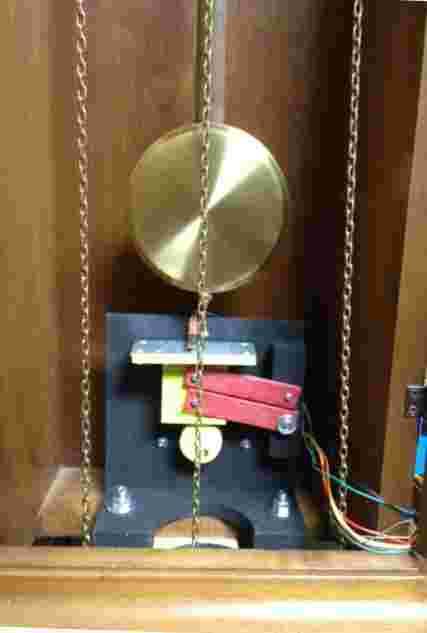 Significantly, the tuning remains even accurate (as accurate as the clock can support) after power is removed since it relies simply on the proximity of a static steel plate to the pendulum. A number of commentators, perhaps understandably, thought this design gave short shrift to the remarkable accuracy of a long pendulum grandfather clock. Pendulum clocks, according to Wikipedia, increased the accuracy of clocks from about 15 minutes per day to 15 seconds per day when they were first introduced. Just before the introduction of quartz clocks, accuracies of around one second per year were obtained with pendulum clocks! This of course required special clocks that used multiple pendulum one positioned in a low-pressure chamber, careful temperature control of the pendulum length etc. Far be it from me to detract from the natural accuracy of such clocks but I will note that these accuracies still require tuning of the clock and that the present device, in that spirit, is simply a tuner that can be unplugged leaving the clock as accurately tuned as possible after the tuning process is complete. 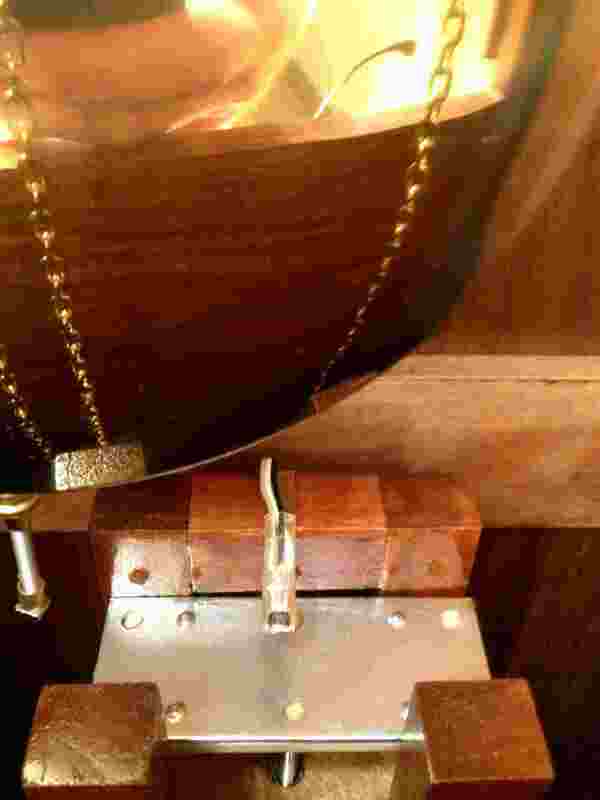 Some skepticism about the design may be because it is well-known that increasing the mass of the pendulum bob (without increasing the effective length) does not change the pendulum speed and the magnetic attraction seems a bit like increasing the weight of the pendulum bob. The difference in this design, however, is that the magnetic attraction increases the downward force on the pendulum bob without increasing the pendulum bob mass or inertia (roughly speaking) so it is more like affecting the gravitational term of the pendulum equation than increasing the mass of the pendulum bob.